Change starts with a single idea. Most ideas are kept inside, never to be set free, but the occasional idea will crawl out and escape into the wild. Set free at last, raw ideas flutter and float recklessly with the changing winds of the world, dancing around and causing a ruckus. Most land in the water, on the rocks, in gravel where they are drowned out, stomped on, or just plain dry up. The occasional idea finds fertile soil, soil that has been carefully cultivated for just such a purpose. A rich land that was crafted and cared for with the specific purpose of nurturing, growing, developing, and bringing ideas to fruition. Leaders in the unassuming small town of San Juan in Bolivia are crafting it into such a place, and their hard work is already starting to bear fruit. The change in San Juan started with a single revolutionary idea in the mind of a woman, which just wouldn’t let it go. Belinda Ferralino dreamed of schools powered by a technology that was anything but mainstream, especially in rural Bolivia. The idea found fertile soil with Belinda, where it grew into possibility when she focused in on a small school in the community of San Juan, Bolivia. Belinda discovered the Zayed Future Energy Prize when searching for ways to bring her idea to reality. Each year, the Zayed Future Energy Prize is awarded to a single school from the Americas to be recognized for its bold vision for a sustainable future. The concept was a great fit for what she dreamed of doing with solar at the school, but she needed help. The original vision needed a champion, and found its match in Katsumi Bani. Having served as the mayor of San Juan for 2 terms – a full 10 years – Katsumi was well equipped to effect change by igniting the passions of the student body at Unidad Educativa Sagrado Corazon 4, where he served as an administrator. He took the idea and ran with it, fleshing out the application for the Zayed Future Energy Prize with dreams of a massive photovoltaic solar installation paired with an equally impressive rainwater capture system that would allow crops to be grown well into Bolivia’s dry season. When the school became a finalist in the competition, the ideas in its Zayed Future Energy Prize application gained traction with students, faculty, and local politicians. When it won the competition as the sole winner for the year for the Americas, it became something of a local legend and took on a life of its own. The local city council and mayor became advocates, dignitaries from all around the country came to visit, even the president of Bolivia stopped by to see what all the commotion was about. And commotion it was. Winning the prize is where the fun ideas and bold visions must be taken from the page and turned into something tangible, where innovative, transformative aspirations must be secured into the earth with concrete and wired up. In short, it’s where the rubber meets the road. Katsumi took up the challenge and began coordinating a finely-tuned orchestra of activity, finances, contracts, and suppliers that had to come together for the project to become a reality. Funds were wired, contracts were signed, and after 2 weeks of construction in July of 2017, the school became the proud owner of a new 80-panel, 25.6kW photovoltaic solar system. The process was fraught with challenges, as the installation location changed three times before a north-facing, free-standing shade structure adjacent to the school’s soccer field was decided on. Within weeks of connecting the new solar system to the local electrical grid, the utility decided that it did not want to allow for the net metering arrangement that was originally implemented, and instantly disconnected the daytime solar production curve from the 24/7 electricity usage at the school. These early discoveries are only a few of the many challenges the solar system has encountered and highlights just how forward-thinking the installation is. Katsumi leveraged his significant political experience to rally city leaders, state politicians, and even supporters at the national level to draft regulations that would allow solar systems to feed power back into the grid. These are the roads that must be cut to make way for progress, and he has the support of the local city council and the new mayor in his push for renewables across Bolivia. The push for regulation supporting the addition of renewables to the grid will pave the way for other schools to take up the call to action and install solar panels of their own. Students look at the inner workings of the inverter and energy production meter. As educators first and foremost, the school is leveraging its experience with the installation of its solar system to build up a generation of changemakers. Students were involved, and indeed led many parts of the award application process. Students left Bolivia for the first time and traveled to Abu Dhabi to accept the Zayed Future Energy Prize. Students have taken up the cause as their own and are crafting plans of their own to change their communities, their school, and their country. The foundation of renewables education at Unidad Educativa Sagrado Corazon 4 is through a series of science lab projects that were funded with some of the award monies from the Zayed Future Energy Prize. The school purchased materials to perform hands-on experiments and projects with solar panels, batteries, and motors. Students are assembling solar-powered toy cars that show how simple systems can function while also providing powerful hands-on experience with solar panels. Seeing a toy car motor down the street under the power of a small solar panel provides a tangible connection to the solar panels out in the field powering the school. A handful of students are taking the lessons learned through the solar project to grow beyond the borders of the school by sharing them with students and teachers from neighboring schools. 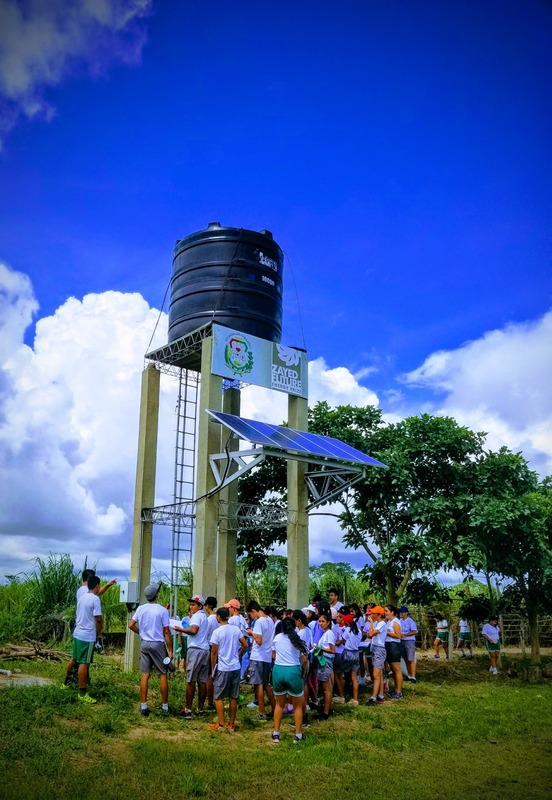 Groups of students have come to Sagrado Corazon 4 to learn about the solar system and rainwater capture system that were installed at the school almost non-stop since they were installed in 2017. Sustainability is just a concept on paper until it grows off of the page into real, tangible actions. In San Juan, sustainability has taken root in the minds of a generation of students at Unidad Educativa Sagrado Corazon 4. The fuse has been lit in their minds and the sky is the limit as to where they will go with their disruptive renewable energy ideas. Maria, a young woman attending the school, decided that as a result of the potential she saw in the technologies used in the project that she is now planning to work in renewable energy after graduating instead of in the medical field. Students get their hands dirty building solar-powered electric cars. Raising up change leaders who have been inspired by the possibilities inherent in sustainable energy and rainwater collection is already bearing real fruit in the community. Students at the school have carved out two gardens that run the length of the school to make use of the captured rainwater. Sparks of recognition light the eyes of students when they see how the elevated rainwater capture tank allows them to literally turn on a tap next to the garden to use the water to grow crops through the inevitable dry weeks. The recognition of the potential to scale the work on sustainability that has been done at Unidad Educativa Sagrado Corazon 4 is also making waves at the national level. Political leaders at different levels are now engaged in discussions about the possibility of installing solar and rainwater capture on other schools around the nation, adding further support to the fight for pro-renewables regulation and more favorable electricity net metering policies. Students use captured rainwater to grow crops during the dry season. After seeing the work happening at the school firsthand, national leaders are doubling down on the school, starting work in 2018 on a new addition to the school that will allow for much needed breathing room in overcrowded classrooms and provide modern educational tools to support the school’s mission. Ideas have the power to transform lives, and at Unidad Educativa Sagrado Corazon 4 school in rural San Juan, the ideas of a handful of dedicated educators are transforming not just their school, but their community and their country through their tireless commitment to integrating sustainable living practices at their school.